Eyes are my number one concern when it comes to skincare – I suffer from quite dehydrated skin, especially around my cheeks and under eyes. So if there’s one thing I can always guarantee I have close at hand and a plentiful variety of options of – its eye care products. Alpha H Absolute Eye Complex* – I mentioned this in my new season, new skincare post recently and it’s still making a frequent appearance. This one I love for its ‘resurfacing/refreshing’ claims – the idea that it keeps the area looking fresh and perky in this way rather than just adding hydration. Heal Gel Eye* – another product that’s become a regular feature, I initially loved the original Heal Gel and now the eye one is pride of place. It’s a cool refreshing gel that hydrates, refreshes and apparently helps heal skin… My eyes do feel better from the moment I apply this. One I like to use day or night. Clinique All About Eyes Serum* – this is my tired-eyes go-to. Cooling, and refreshing. The roller ball is an absolute wonder on tired eyes. Late night or just want a post-work-day in front on computer refresh? This is amazing. It doesn’t deliver hydration in the same way as some of the others, but it does leave skin feeling cool and de-puffed. 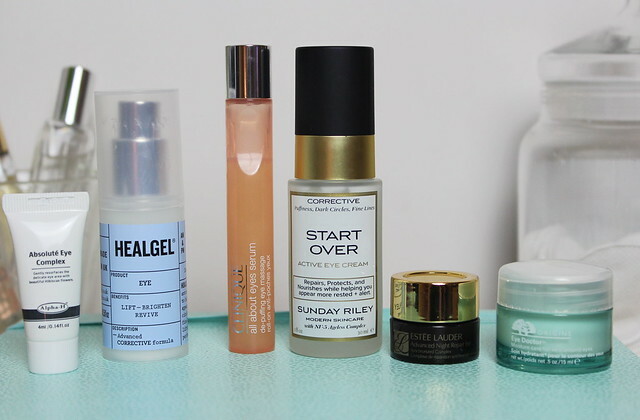 Sunday Riley Start Over Active Eye Cream* – I was a tad worried I’d fall for this one and I was right. This is a lovely all rounder – cooling, hydrating, lovely gel that instantly lifts the whole eye area and the hydration levels really do last well. Origins Eye Doctor* – a great all rounder if you want a quick and easy shot of hydration. Perhaps you have dehydrated under eyes but don’t want to go fully down the anti-ageing eye cream route yet? This is a fab starter for 10 – the cream is fairly thick, but absorbs straight in and leaves eyes instantly plumped. I really want to try the Alpha H absolute eye complex, I have heard good things about it. I am using the nuxe eye contour lotion and I am really likeing it. It helps my eyes to stay moisturized and makes putting concealer on the next day a breeze. Oh man – I’m jealous of your eye cream stash! I actually don’t have an eye cream on the go at the moment which is very naughty as it’s where the majority of those ‘fine lines’ appear on my face. Have you tried the astalift eye cream? I love that one. I think I may get the ANR cream this time though.